The barber shop has a legal responsibility to ensure the health and safety of employees and other people affected by its business activities, like customers and suppliers. But rather than do the bare minimum to comply with legal requirements, try to go a step further. After all, poor health and safety in the workplace can lead to accidents, illness and significant costs for the business, so good health and safety practices can effectively pay for themselves as well as improve the barber shop’s reputation with customers, regulators and employees. To comply with occupational health and safety rules, an employer should carry out a thorough health and safety risk assessment, draw up a health and safety policy, ensure the workplace meets minimum standards of comfort and cleanliness, record any serious injuries, diseases or dangerous accidents in an accident book and, in some cases, report these incidents to the relevant authority. The barber shop must also comply with legislation designed to reduce the harm the business may cause to the environment, and failing to follow these occupational health and safety rules can lead to a fine or prison sentence. In some circumstances, the business can be closed down. Forward planning is the best approach to managing health and safety issues. Get the right procedures and practices in place from the start and then monitor them regularly to ensure they are being carried out and are still appropriate. Update assessments whenever anything changes – for instance when buying new equipment, employing new members of staff or changing workplace practices. Check that new equipment is suitable for the task it will be required to perform and carry out regular maintenance to keep equipment operating at full efficiency. 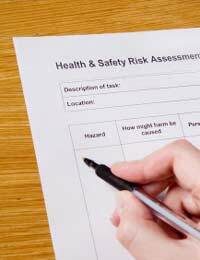 Carry out routine mini-assessments to identify potential problems and ensure employees are following safety procedures. Try to involve employees and encourage them to suggest improvements. Failing to establish and implement good health and safety policies and procedures in the workplace can be an expensive mistake. If the worst happens, the barber shop may end up paying the wages of the employees who are ill or injured as well as the costs of covering their jobs. Inexperienced replacements can lead to disruption and lost productivity. Accidents can lead to fines and legal costs if the business is prosecuted and cause damage to equipment or premises. It can be expensive to correct the problem too. Of course, the business should have insurance in place, but it is unlikely to cover all the costs that can result from an incident, and the insurance premium will probably rise if a claim is made. Small businesses, like a barber shop, can be particularly badly hit by injuries or illnesses that result from poor health and safety practices. This is because if one key employee is off sick out of a total of four employees, a quarter of the workforce is lost and this can result in customers going elsewhere. There are also intangible costs. If the barbers gets a bad reputation, it could lose customers and find it tougher to recruit employees. I wish open a new barbershop,so I want exactly know what type of document I need and where I can do them please . the information is ok but there are questions you may need to answer for readers, what are some of the health and safety issuses faced within a barber shop.